Brief summary of operational items students may need to know when checking out a library laptop. General settings for students using a UWGB checkout laptop. UWGB campus checkout laptops running Windows 10 available for student use will have no local accounts, requiring users to with campus credentials before laptop is taken off campus. When on campus, the computer will automatically connect wirelessly to the UWGB domain when logged in with a student account. Each user for a laptop must logon to network while still on campus with a wireless connection. Failure to do this will result in no account to use for login when off campus. 3.Every time you logon will take about a minute to connect automatically to the UWGB Domain wireless network. You can check if you are connected on the bottom right corner of you screen. 2. If you don’t see your M:\ drive, open File Explorer. 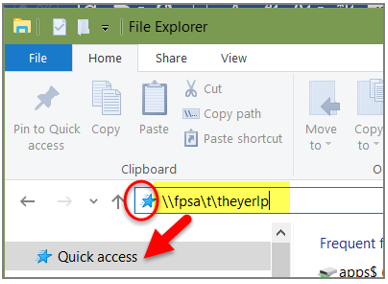 Click on the icon in the Address bar and type the address for your m:\ drive: (for example: \\fpsb\a\alexh99 \\fpsb\d\darwaj11). Then drag the location on top of the Quick Access location to pin it. 3. Class shares can be added using the steps listed above in Step 2. The most reliable way to check email is to use Outlook webmail (www.uwgb.edu/webmail). E) Installing new software - Using "Make Me Admin"
To protect your laptop, we have disabled users as the "local administrator". 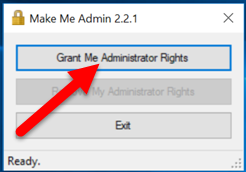 If the need arises, use the "Make-Me-Admin" app located on the desktop. This app will allow you 15 minutes as a local administrator and allow software to be installed. F) Have you Changed your Password? After you change your campus password, you might be required to login to the laptop with your old password until the change is synced. This might occur if your password is changed on another device while the laptop is offline.